Have you ever wondered how long your focus could last while walking on top of a one-inch-wide piece of slackline webbing? Theoretically, if a line continued in distance for as long as the eye could see, at what point would you fall off? At what point would the world’s best balanced athletes fall off? The discipline of “longlining” attempts to answer this question and the record lengths continue to exponentially grow as webbing technology and skill level of slackliners worldwide advances. This question of distance becomes the main focus and adversary for “longliners” who naturally take this challenge to great heights as well. Antony Newton making giant strides across 1,617 feet of webbing. In the world, there exists a very small niche community of highly trained slackliners who devote their lives to balanced practices daily and break staggering world records regularly. The observation I’ve made of these talented individuals is that, the majority of them aren’t pursuing this challenge to stroke their egos or for any real claim to fame. Walking across a slackline is a very arbitrary and personal accomplishment all things considered, and there is little notoriety for it in mainstream culture. Instead, what I’ve experienced is that their deepest motivations and desires, to push the limits of body and mind, stem from a profound need to be the best version of themselves. To explore their outer limits and see what is humanly possible when strict rules and definitions are ignored. During this Fall season, those limits were pushed longer and higher than they ever had been before. The full scale of 1,617 feet of rigged webbing. This is a fun game… Can you spot the highliner? As it stands, the current world record length highline crossed without falling has been claimed by Theo Sanson. Naturally being a frenchman, he was joined by his traveling companions Antony Newton and Thibault Arrappiccatu. They came to Moab, the mecca of infinite highlines, to give this challenge some serious attempts and keep the stoke high. This line spanned across the iconic Castelton Tower all the way to The Rectory in Castle Valley, Utah. Arguably one of the most beautiful slacklines I’ve seen in person, its total distance was 1,617 feet long and was rigged with less than 300 pounds of standing tension. For anyone out there that doesn’t want to think about math, that means the line had about 80 feet of sag with an average sized person in the middle. The summits of The Rectory and Castelton Tower don’t stand at equal heights as well, with about 100 feet of altitude difference between them. What you have then is a very loose and sagging monster slackline with hundreds of feet of dizzying visible exposure. Theo Sanson begin a long journey across to the other side. 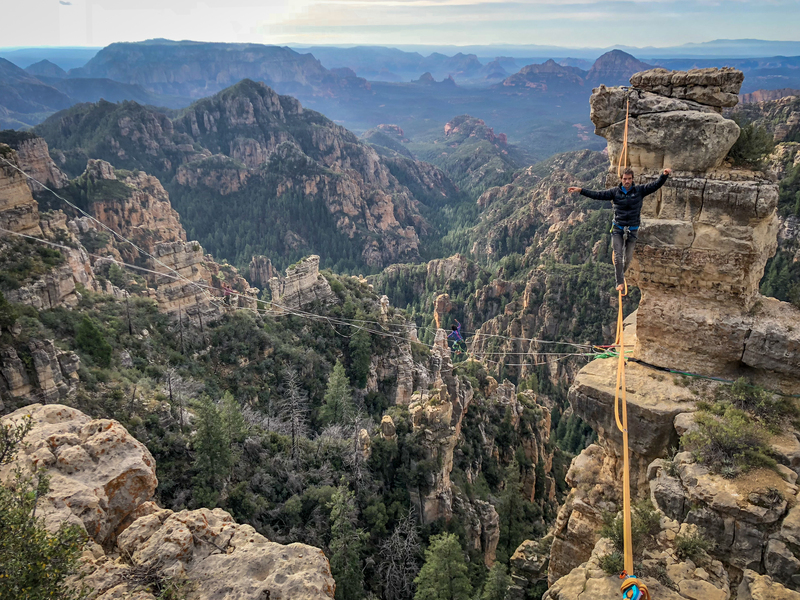 Antony Newton making giant strides across 1,617 feet of a one-inch-wide piece of webbing. Living in this vast desert landscape where adventure enthusiast are constantly flocking here, year after year, I consider it a huge privilege to witness and be a part of these monumental accomplishments. It reaffirms to me that the expanding boundaries of what is humanly possible remains a very dynamic and constantly shifting reality. Surrounded by such inspiring artist, riggers, slackers and athletes over all, continues to facilitate growth in my own personal life and I hope this all transpires down the line to everyone else as well. To all those who were a part of this impressive project I want to personally thank you all… Until the next personal or world record is broken, which I’m sure is bound to happen in no time at all, this remains in my memory as a historic time to be living and thriving outside.